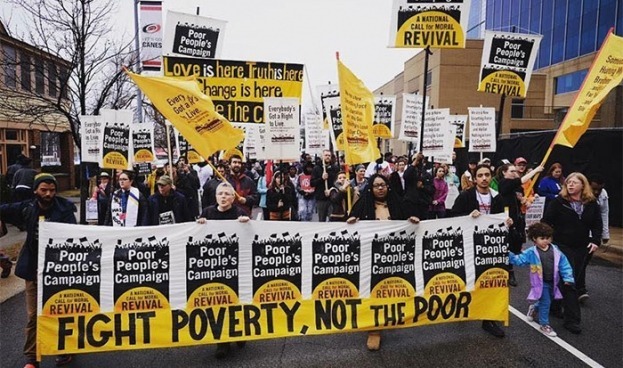 Started on Mother's Day 2018 and continuing 40 days until June 23 — the last day of the 1968 effort — the revived Poor People's Campaign calls people to protest policies that perpetuate poverty, systemic racism, war, and ecological devastation. Across the United States, concerned citizens grounded in an ethic of love are mobilizing others, engaging in civil disobedience, and using social media to spread the word. "Eternal God, out of whose mind this great cosmic universe, we bless you. Help us to seek that which is high, noble and good. Help us in the moment of difficult decision. Help us to work with renewed vigor for a warless world, a better distribution of wealth, and a brother/sisterhood that transcends race or color." "O God, we thank you for the lives of great saints and prophets in the past, who have revealed to us that we can stand up amid the problems and difficulties and trials of life and not give in. We thank you for our foreparents, who've given us something in the midst of the darkness of exploitation and oppression to keep going. Grant that we will go on with the proper faith and the proper determination of will, so that we will be able to make a creative contribution to this world." "God, give us strength of body to keep walking for freedom. God, give us strength to remain nonviolent, even though we may face death." "Make us willing to do your will, come what may. Increase the number of persons of good will and moral sensitivity. Give us renewed confidence in nonviolence and the way of love as taught by Christ. Amen."